This summer, 2016, I will join America By Bicycle on a supported cycling tour from Portmouth, NH to Jacksonville, FL. The 1686-mile ride will cross 11 states and the District of Columbia over 25 days. 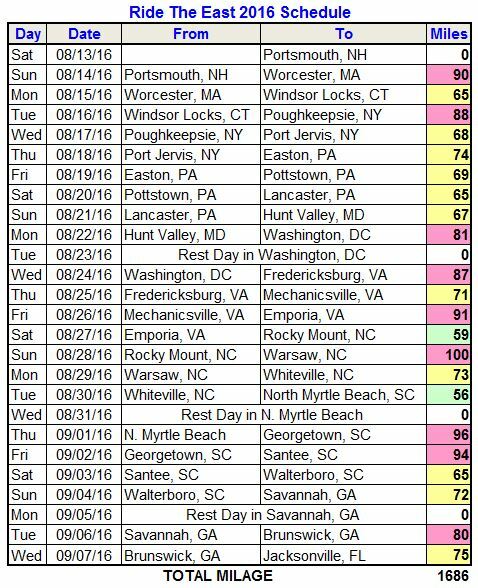 We will leave Portsmouth on Aug 13 and finish in Jacksonville on Sept 7, with a rest day in DC, Myrtle Beach and Savannah. You can visit my journal page for a daily description of the ride and some supporting pictures. Cycling statistics captured with a Garmin bike computer will also be summarized in the post. To learn more about this ABB tour, visit their website at this link ABB RtE.